Find the Menards weekly ad sale valid February 18 – February 24, 2018: $4.99 Direct Home Marathon Entrance Mat 3′ x 4′; $24.98 Pittsburgh Paints & Stains Grand Distinction First Frost Flat Interior Latex Paint – 1 gal. ; $13.99 DuPont Premium 14″x20″x1″ Pleated Replacement Air Filter MERV 12; $1.97 quart Formula Shell 10W-30 Motor Oil – 1 Quart; $2.99 8 quart Burpee Natural & Organic Premium Potting Mix – 8 qt. ; $1.99 J.R. Watkins Silicone Slotted Turner; $7.48 Menards Full Strength Antifreeze + Coolant – 1 Gallon; $3.99 Crocs Utility Lighter Bonus Pack; $2.49 Patriot Lighting Mini Solar LED Crackle Path Light; $6.99 Apple Peeler, Corer & Slicer; $11.69 Mastercraft 1 x 4 x 8′ Red Oak Board(Actual Size 3/4″ x 3-1/2″ x 8′); $25.98 Dutch Boy Refresh Interior Paint + Primer with Odor-Eliminating Technology – 1 gal. ; $13.99 Zinsser Bulls Eye 1-2-3 Gray Interior/Exterior Primer – 1 gal. ; $5.98 Polar Plastics 10′ x 25′ 3-Mil Rolled Poly All-Purpose Plastic Sheeting; $7.99 Purdy White Dove 4-1/2″ Woven Dralon Jumbo Mini Roller Paint Kit – 4 pc. ; $119 Carpet Art Deco Serenity Ivory Area Rug 5’3″ x 7’5″; and more. 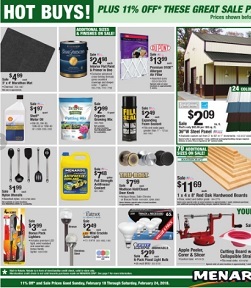 Find all deals and offers in the latest Menards Weekly Ad for your local store.